It was one of the most highly anticipated games of the season. After going undefeated the entire season and claiming the shield trophy after successfully defending during the season, The Ninjaz were on a quest to claim the elusive title that escaped them last year. In 2013, the Ninjaz were the major favorites to compete for the 2013 title. The Mesepa Sonics who've been absent for 2 years, made the return and challenged them. After leading the entire game, a complete meltdown in the second half, led to a major comeback and upset of the Ninjaz, after the Sonics completed dismantled the Ninjaz defense with a barrage of 3 pointers and defeating the Ninjaz and leaving them stunned. In 2014, the Ninjaz weren't looking to let this opportunity slip away, as they meet up with the Sonics for a rematch for the 2013 championship game. 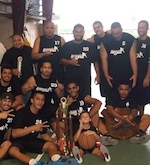 Unlike the last time, the Ninjaz were as dominate during the season as they rolled through the championship game with ease to take home the 2014 championship by a score of 87 - 62. MVP for the game from the Ninjaz was Junior Luvu with a high score of 20 points & 8 rebounds. ASBA President, Milton Taufa'asau congratulated the Ninjaz, Sonics & the entire men's division for a successful season of fellowship and good sportsmanship.